The cataract service offers specialised care for the diagnosis and management of cataract. 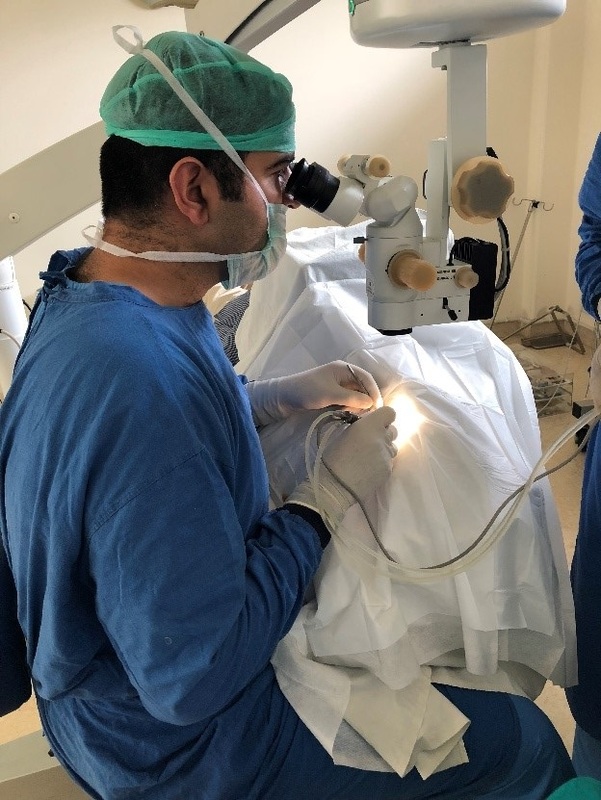 It provides services including evaluation of cataract, work-up of cataract and cataract surgery using advanced phacoemulsification procedures with a gamut of intraocular lens options to choose from. What is cataract? What does having a cataract mean? A cataract is a clouding of the normally clear lens of your eye. For people who have cataracts, seeing through cloudy lenses is a bit like looking through a frosty or fogged-up window. Clouded vision caused by cataracts can make it more difficult to read, drive a car (especially at night) or see the expression on a friend's face. Most cataracts develop slowly and don't disturb your eyesight early on. Eventually, with time, cataracts will interfere with your vision. At first, stronger lighting and eyeglasses can help you deal with cataracts. But if impaired vision interferes with your usual activities, you might need cataract surgery. Fortunately, cataract surgery is generally a safe, effective procedure. Mature senile/Immature senile cataracts: These cataracts occur due to the normal aging process which affects the lens which results in opacification. They generally occur in people after 40 years of age. Congenital cataracts: Some children may have signs of cataract when they are born. If these cataracts are progressive then they have to be treated. There are some cataracts which occur at birth and remain the same or change very slowly. These cataracts do not need to be removed surgically if they are not hindering the vision. Frequent changes in corrective glasses or contact lens prescription. At first, the cloudiness in vision caused by a cataract may affect only a small part of the eye's lens and the patient may be unaware of any vision loss. As the cataract grows larger, it clouds more of the lens and distorts the light passing through the lens. At this point, there may be signs and symptoms which are more likely to get noticed. Most cataracts develop when aging or injury changes the tissue inside your eye's lens. Some cataracts are related to genetic disorders that cause other health problems and increase your risk of cataracts. Cataracts can also be caused by other eye conditions, medical conditions such as diabetes, trauma or past eye surgery. Long-term use of steroid medications, too, can cause cataracts to develop. Cataracts may develop in only one eye, but they usually develop in both of your eyes. However, the cataracts usually aren't totally symmetrical, and the cataract in one eye may be more advanced than the other. What are the risk Factors of cataract? A slit lamp allows your eye doctor to see the structures at the front of your eye under magnification. The microscope is called a slit lamp because it uses an intense line of light, a slit, to illuminate your cornea, iris, lens, and the space between your iris and cornea. The slit allows your doctor to view these structures in optical slices, which makes it easier to detect any tiny abnormalities. To prepare for a retinal examination, your eye doctor puts dilating drops in your eyes to open your pupils wide. This makes it easier to examine the back of your eyes (retina). Using a slit lamp, your eye doctor can examine your lens for signs of a cataract. Talk with your ophthalmologist about whether surgery is right for you. Most of the ophthalmologist suggest considering cataract surgery when your cataracts begin to affect your quality of life or interfere with your ability to perform normal daily activities, such as reading or driving at night. It's up to you and your doctor to decide when cataract surgery is right for you. For most people, there is no rush to remove cataracts because they usually don't harm the eye. Delaying the procedure won't make it more likely that you won't recover your vision if you later decide to have cataract surgery. Take time to consider the benefits and risks of cataract surgery with your doctor. If you choose not to undergo cataract surgery immediately, your eye doctor may change your glasses and recommend periodic follow-up exams to see if your cataracts are progressing. How often you'll see your eye doctor depends on your situation. Once you decide to have your cataracts removed, you will have to undergo further testing to personalize the lens to your eye. The artificial intraocular lens you are given will be partially decided by your existing number, the length of your eye and the shape of your cornea. Tests will be done to determine these variables. When you have had these tests, and decide on a date for the surgery, you will be given a set of preoperative instructions. These instructions will inform you on how to go about the surgery and what medications you will be required to take before you come to the operation theatre. The surgery requires no major preparation in the form of diet restrictions. You will be asked to come to the operation theatre about one hour before the operation so that you can settle down before you actually go in for the operation. The surgery itself will take approximately 15 minutes but there will be a preparation time of another 30 minutes or so. During the surgery, you will be asked to lie down and will be given instructions on how to cooperate with the surgeon. Eye examinations can help detect cataracts and other eye problems at their earliest stages. Ask your doctor how often you should have an eye examination. Wear sunglasses: Ultraviolet light from the sun may contribute to the development of cataracts. Wear sunglasses that block ultraviolet B (UVB) rays when you're outdoors. Manage other health problems: Follow your treatment plan if you have diabetes or other medical conditions that can increase your risk of cataracts. Maintain a healthy diet: If you currently have a healthy weight, work to maintain it by exercising most days of the week. If you're overweight or obese, work to lose weight slowly by reducing your calorie intake and increasing the amount of exercise you get each day. Excess usage of nutritional supplements can also cause cataracts so do not self-medicate. Choose a healthy diet that includes plenty of fruits and vegetables: Adding a variety of colorful fruits and vegetables to your diet ensures that you're getting many vitamins and nutrients. Fruits and vegetables have many antioxidants, which help maintain the health of your eyes. Why choose Noble Eye Care Gurgaon for cataract surgery?